Britain’s historic decision to leave the European Union is sending shockwaves through global markets, June 24, 2016. Global stock markets dropped sharply, oil prices fell and the value of the British currency plunged to a three-decade low Friday after the unprecedented vote for Britain to leave the European Union. Worried investors sought safe havens for their money, buying up gold and certain government bonds. Key U.S. stock indexes were down 3.3 percent or more in Friday's trading. European markets also fell, with London's key index off 3 percent and France's plunging 8 percent. The Bloomberg financial news service estimated that Asian stocks lost $700 billion during Friday's trading. Japan's stock market fell so sharply that officials stopped trading for a brief time to calm things down. The major credit rating agencies said Brexit would hurt Britain's economy. Moody's said the vote signaled a long period of "uncertainty" that would "weigh on Britain's economic and financial performance." S&P said Britain's credit rating might be downgraded. Fitch called the vote "credit negative." Harvard law professor Hal Scott, who researches international systems, said the economic fundamentals had changed for Britain, but not enough to spark a recession unless there is an "irrational" panic. He predicted that the current market turmoil would go on for "a while." International Monetary Fund (IMF) Managing Director Christine Lagarde speaks during a news conference in Washington, June 22, 2016. The head of the International Monetary Fund, Christine Lagarde, urged Britain and Europe to negotiate a new economic relationship in as "smooth a manner as possible." 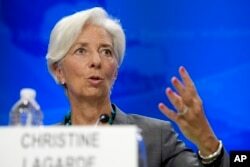 She said the IMF welcomed measures announced by the British and European central banks to ensure banks can continue to make loans. Uncertainty worries lenders and investors, who tend to stop making loans during times of crisis, which can further slow the economy and worsen the problem. The Bank of England has set aside $342 billion to help provide "liquidity" to keep markets running. U.S. Treasury Secretary Jack Lew said policymakers have the tools necessary to "support financial stability," which is important to economic growth. World Bank President Jim Yong Kim said his agency was ready to support member countries. Japanese Finance Minister Taro Aso told reporters Japan was closely watching the "extremely nervous" foreign currency markets, while South Korea’s government pledged to "take all necessary measures" to soothe the foreign exchange market. So far, the biggest victim from the vote appeared to be the pound, which dropped in value from $1.50 to around $1.34 at one point. The lower value of the British currency will make imported goods more expensive there, which could boost inflation. But the cheaper currency also means British-made goods will be less expensive abroad, and thus easier to sell on global markets and boost British exports.